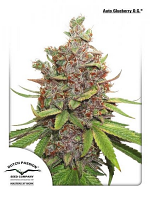 Critical Jack is only one capable of flowering in 70 days, producing up to 21% THC. This time, we have crossed our Critical+ with the most productive sativa in our catalogue of mother plants. The results are obviously convincing, 60 days of flowering are enough for a harvest of plants that have a rapid growth. Their aspect is shabby like the sativa, with ample knots and very large light green leaves that hang limply. It does have a strong effect, well balanced. The modification increases its psychoactive side. It has an intense fruity flavour, but in some samples, this varied to a lemony taste of wood. Very productive, even more than Critical+, an authentic flower producing machine, flowers which are very regular in size and homogeneously placed on the branches –an heirloom received from its Critical+ side -. There is a clear increase in strength and a noticeable resistance against damp and fungus. If the weather is too wet or climate conditions unfavourable, outdoor plants can be, harvested at the end of September. The results are, guaranteed to surprise you. For Critical+ lovers, you want this girl.